How did all the troubles start in Rwanda? We all see and hear the stories of the Genocide that took place there- but how and why did it begin? And what is it really like to have experienced such an ordeal? How do you come to terms with it? Is there a reason to go on living in the face of such an experience? These are some of the questions I had when I started to read this book. And you know what? Mr. Sebarenzi answers them all in a beautifully arranged narrative of his own experiences. Born into a Tutsi family in Rwanda Mr. Sebarenzi is sent across Lake Kivu to get an education in the city of Idjwi. His father has forseen the coming ethnic violence and wants his 3rd eldest son to go in order that someone from the family will survive. He hopes that armed with an education his son can someday work for change. This was a fortuitous decision. 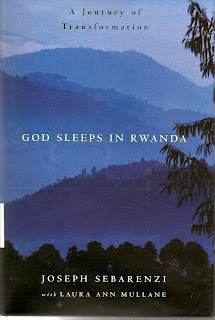 Rwanda is a small country nestled beside the Democratic Republic of Congo and Uganda. The whole area was once under French and Belgium control. When the end of colonization came the people were basically unprepared for self rule. The conflict between Tutsi and Hutu dates back to about 1959 and the end of colonial rule. Throughout the uprising of the Tutsi and Hutu tribes the author is constantly questioning why and how such things happen. He meets and marries a woman and they flee, he to Canada and she and their children to Uganda. When the war ends he elects to return home with his wife and 2 children. He wants to see what has become of his native land and if there is anything he can do to help rebuild it. When he returns he finds the Tutsi in control and the tables turned on the Hutus. But rather than rejoice at this victory he questions how people can justify these acts. He wonders how they can forgive and move on. When he meets the former Mayor of his village, a Hutu, now imprisoned, and realizes this man was responsible for the murder of his Mother, Father and most of his brothers and sisters, he is puzzled by his own lack of hatred. Instead of wanting revenge he feels sorry for him. An old man was explaining to his grandson the nature of good and evil. "My son," he said, "there is a fight between two wolves inside us all. One is Evil. It is anger,envy, jealousy,greed, arrogance, self pity, resentment,inferiority, false pride and ego. The other is Good. It is joy, peace, faith,love, hope, humility,empathy, genorosity, truth, compassion and faith." The grandson looked at his grandfather with fear in his eyes and asked, "Which wolf wins?" The grandfather answers, "The one you feed." With this valuable lesson he becomes active in church and then in politics. He eventually rises to the elected post of Speaker of Parliament. He works for change and reconciliation in his war ravaged homeland. This book is a wake up call. It is an alert to extremism. Any extremism. The lesson here is that just because your side has the might it doesn't have the right. Those come from somewhere higher. An enlightening read on a subject that gets too little attention, I can strongly recommend this book. And one final word, Mr. Sebarenzi's father was right- his third son lived to get an education and work for change. And that is a tribute to his father as well as to Mr. Sebarenzi.